From My Diary. Fall 2017. Hi there. This is Dylan. Long time no see. And a lot has happened since then. Not all good. In July dad went to heaven. One day he was here, the next day he was gone. All his things and clothes remained just where he’d left them. His smell was still here. He left without taking anything with him. And he didn’t tell me he was going. Like mom, I’ve been very sad about that. I remember the love he gave me. The back and tummy rubs. And the silly routines we had perfected together. I’m trying to teach mom, but she’s a slow learner. It will take time for her to grasp everything. Dad was a natural. I miss him. I have a bout of separation anxiety every time mom leaves home without me. I know exactly when she’s planning to leave. And even the thought makes me fearful. Already before she grabs her purse I’m busy hoping she’ll come back. And not go to heaven like dad. To help my anxiety, mom bought me a Thunderskirt. I have to admit that while I don’t like clothes in general, that one makes me feel a bit safer. And it’s warm too. Just right for days like today when it’s windy and almost freezing. Only 55F/13C. And then a hurricane hit our area in early September, the first in almost 100 years. I was not born at the time of the last hurricane, but mom might remember it. Anyway, we took an impromptu trip to Philly. Just hopped on an airplane and left. That was quite an adventure. It was my first time to fly. The security check was easy, I had a tick mark on my ticket so I just ran through the metal detector before mom. Then I checked out the Admirals Club, but there were no dog treats. Mom gave me a small piece of cheese. Then I flew like a pro. To tell you the truth you don’t actually need to fly. The big metal crate has large wings and it does all the work. You just sit back and enjoy the ride. The hardest thing on this trip was to go to the restaurants with our friends. I had to lie low and be quiet in the booth next to mom. I smelled chicken, bacon, cheese, you name it, but had to keep my head down. No sniffing. It was hard. But somehow I rose to the occasion. Nobody even knew I was there. Right, Gladys? I have to tell you that I’ve never seen so many geese in my life. They patrolled the vicinity of our hotel every day. Again, I had to practice self-discipline. All in all, it was a great trip. I realized I like to travel. 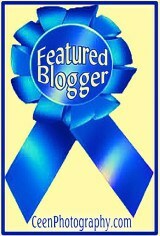 And I hope mom gets me a frequent flyer card. Oh wait, that might not be such a great idea when I think about it. Smells like a double-edged sword. With more miles mom might travel even more. And there’s no guarantee she’d take me everywhere. Like earlier in the fall and again recently. You know, she’s been away twice in the last three weeks. First time she told me she’s going to look for a new home for us. New home? What does that mean? I love my home, my sitter and all my friends, like Bentley and others, at the dog park. I’m not moving. Full stop. I have to come up with an emergency plan to get that out of her head. All tips are welcome. I just hope it’s not too late. After coming back, mom took me for a nice outing. 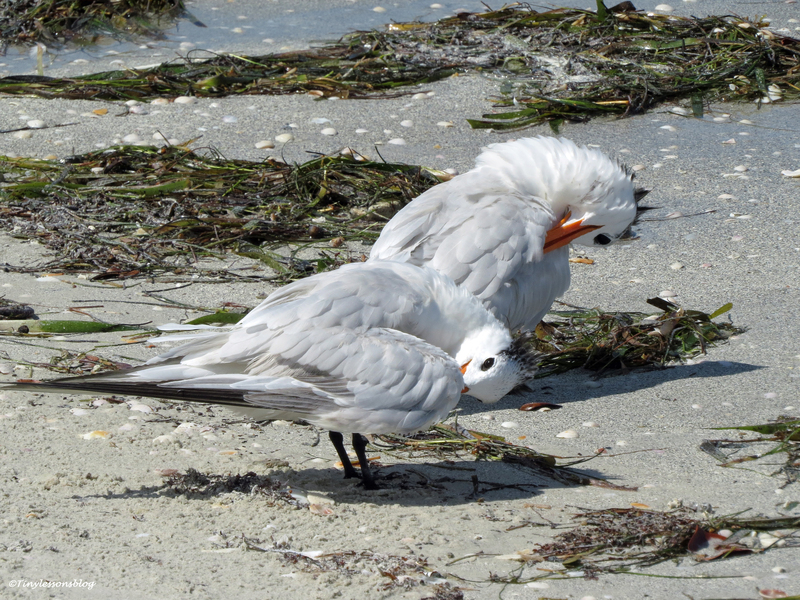 We went to see some birds at Fort de Soto Park. We walked the trails near the beaches and found many different birds, big and small. But the most interesting part of the trip was sniffing around at the old fort. By far. The smells were fascinating. Markings of dogs long gone mixed with faint traces of gun powder around the old canons. I like that stuff. Then we found another fort. And the soldiers were still there. Mostly pelicans and cormorants. They were guarding the island. Who knows what might come from the sea. One pelican even gave me the look. Like questioning my right to be there. At the end of the day I was happy, but exhausted and hungry. My dinner time was dangerously close. But mom said she didn’t want to leave before she found at least one osprey. Right away I pointed out several of them for her. They were pretty far away, but she should have spotted them. Then we finally drove back home. And I got my dinner 30 minutes late. This past week mom left again. For work, she said. That word always sounds iffy to me. I don’t like anything that smells work. Bad smell right off the bat. I suspect she was doing sightseeing. Who can work four days in a row anyway? Impossible. And my hunch proved right. I caught her looking at pictures that didn’t look like work. Even I recognize the building. I watch the news. MSM. And mom’s not working at the White House, is she? I hope not. But here’s the evidence that she was there. Both day and night. Sometimes she’s so difficult to read. Whatever the whole truth, the main thing is she came back. That she’s here now. Giving me tummy rubs. I just hope this lasts for a while. Surprises. And Almost a Heart Attack. It started innocently enough. On Tuesday afternoon, just around dinner time, husband asked me if I had seen ‘the birds’, aka the Osprey family. My nose had been clued to the computer all day, so I went onto the terrace with my binoculars and my super zoom. And almost got a heart attack. The Osprey nest was empty! I mean, no adults around. A little head was sticking up from the nursery. What an earth had happened? I waited. No parent came back. And suddenly the first-born got very anxious, flexed its tiny featherless wings and screamed from the bottom of its lungs. Ma-ma! The second-born lifted up its head as well. They were alarmed. Then, after several minutes, one of the parents landed on the perch. It was impossible to tell which one. I assumed it was Papa Stanley because Mama Sandy would have landed in the nest. All kinds of thoughts flew through my mind on what might have happened to Sandy. You see, normally she would not leave the chicks alone before they are six weeks old, and these chicks were hardly three weeks old last Tuesday. Right after finishing my dinner I checked on the nest again. Someone was feeding the chicks! It looked like Sandy. And – surprise, surprise – she had three chicks in front of her! The two older chicks are bigger and ‘darker’ and the youngest chick (in the middle) is still very small and much lighter in color. That was a much nicer surprise. But I couldn’t be sure it was Sandy until I saw her much closer – from the ground. So out we went, Dylan and I. He knew his mom was on a mission and sat down every time I took pictures. It was late in the day, almost 7:30 p.m., but I was able to confirm Sandy was back with her chicks. That was a great relief. Perhaps Sandy had gotten tired of waiting for dinner and had decided to go fishing herself. For a change. And in the process almost gave me a heart attack. That evening I was treated to yet another nice surprise. Miss Rosa was back! I had not seen her in about six weeks, and it was great to see was fine, beautiful as ever. 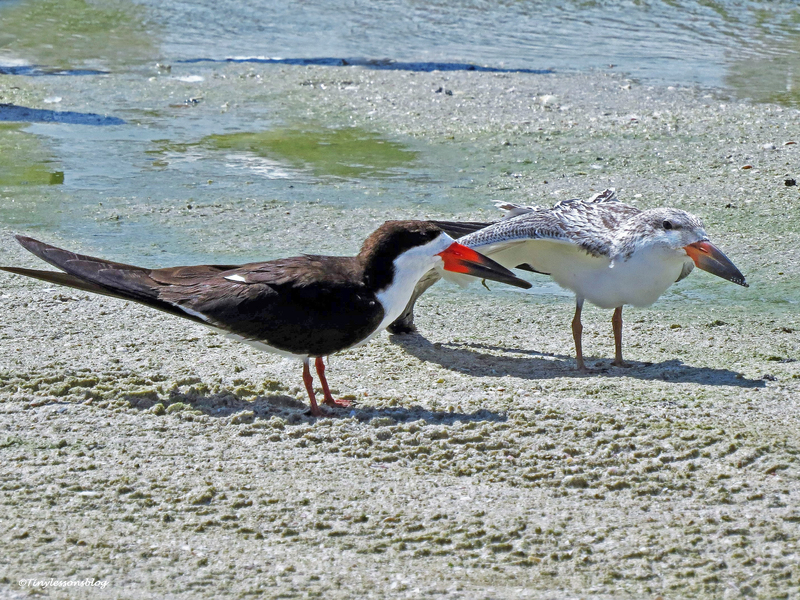 Perhaps she too was on a ‘mommy break’ from nesting activities on the bird island in the bay. And the Mayor was there patrolling the waters, as always. And just before the darkness fell, I spotted a Red-winged Backbird. I know he is nesting at the marsh right now, just like last year. 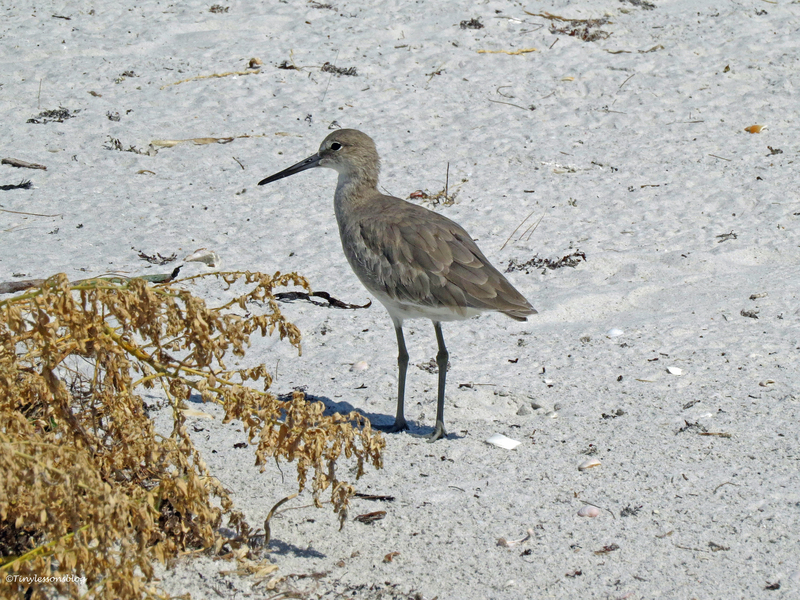 On the bay side, walking back home, we saw a Willet utilizing the low tide to get herself some supper. Yesterday morning I took a quick walk around the marsh, mostly to check on the Osprey chicks. The whole family was gathered. Sandy was feeding the chicks, who had grown a lot since Tuesday. I could only see two of them, but it doesn’t mean that the last-born wasn’t there. The first-born and the middle chick are almost the same size, born only a day apart, while the last chick was probably born two days after the middle chick. At this time in their development four days make a huge difference. The oldest chick is just over three weeks old now and has already learned a lot, like mimicking Sandy when she sounded a warning to a pelican flying over the nest. I had to smile. It has also discovered its wings and is trying to flex them a bit already. In the picture below, Sandy is probably feeding the little one, whom she wisely keeps a bit separated from the two older ones. I am hoping the tiny last-born will survive. Its chances to fledge are statistically only about 38%. But then, Sandy is an exceptional mother and Stanley is a great provider. When walking quickly around the marsh, I got a fourth surprise. Henry, the mischievous young Great Blue Heron, who used to attack the Osprey nest in 2015, was back. 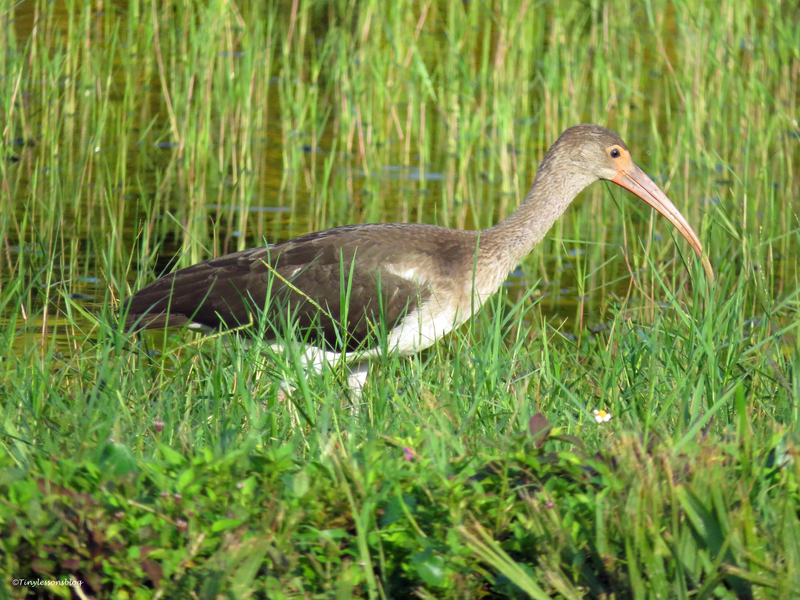 He is still much smaller than the Mayor, and was keenly watching the nest from the north side of the marsh. Not again, I thought. 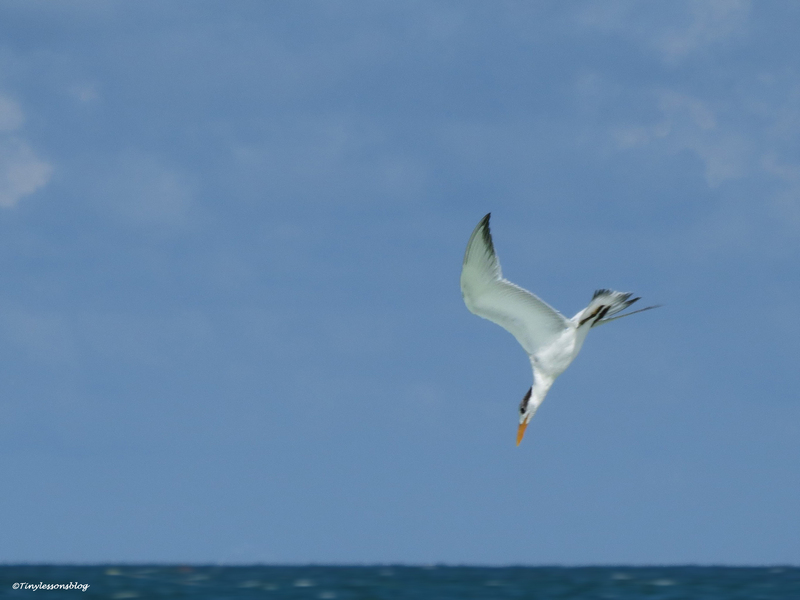 I was trying to move closer to get a clear shot when I heard heavy wing beats. The Mayor was approaching, fast. I was so surprised that I didn’t even get a clear picture of him chasing away young Henry. But here is the end tail of that action. Happy being firmly in charge of the city again, the Mayor settled at the far end of the marsh. Everything was good again. When I left to go home, the courting Mottled Duck couple cruised the calm waters just below the Osprey nest. We all wish you Happy Easter. Rise and Shine. Fall at the Salt Marsh. 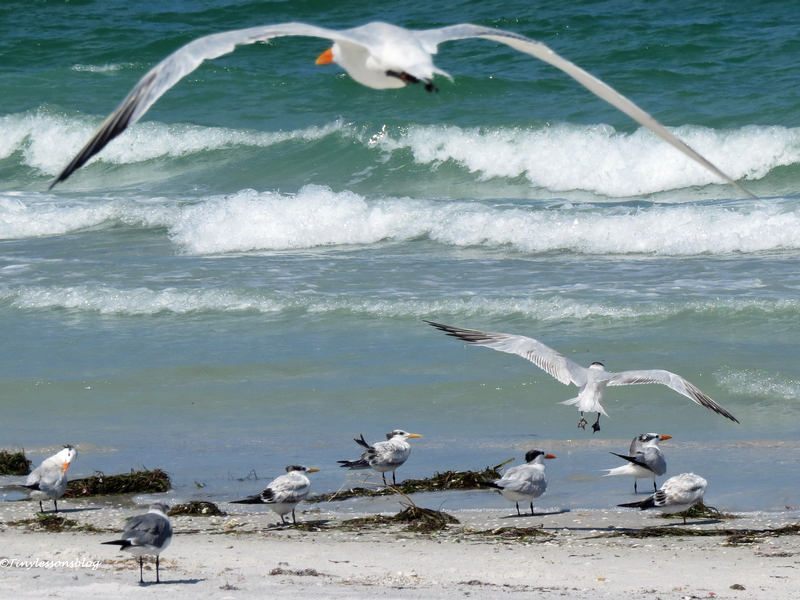 We have gorgeous fall weather here on Florida’s Gulf coast. I want to invite you all to join me on a morning walk on the beach, in the park and at the salt marsh. Being “evergreen” we do not have the typical fall foliage, but there is plenty of color for us to enjoy right here in our garden. And the beach is lively with shorebirds, particularly Sanderlings and Willets, in addition to the usual gulls and terns. From the beach we walk to the fishing piers at north end of the park. Sun is shining on the bay and the Clearwater Pass. People are fishing and birds are flying over the water. We spot two familiar birds: the “other osprey” who was pestering Mama Sandy last week, and Henry, the younger Great Blue Heron. For some reason, Henry is not at the salt marsh, but has flown into a kayak enclosure next to the fishing piers. Perhaps hoping for a free meal from one of the fishermen. 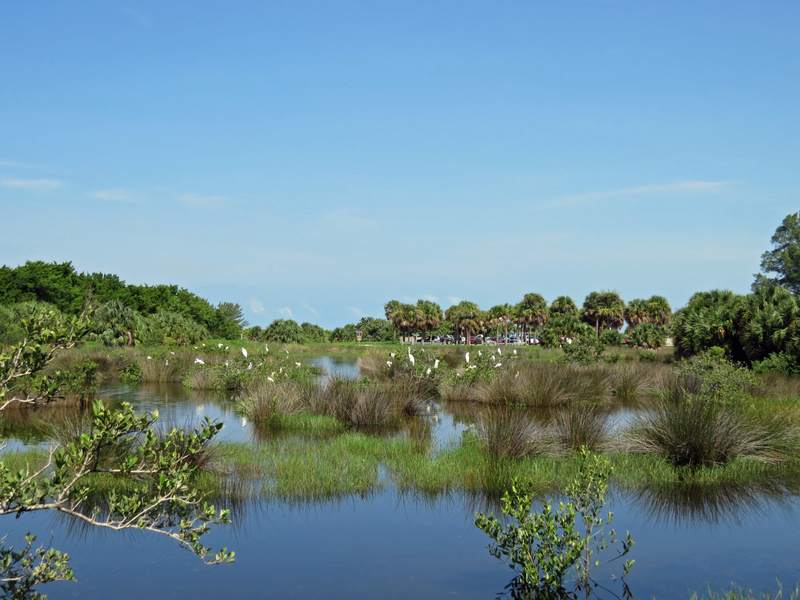 From there we walk south through the park to the salt marsh. And spot more fall colors on the way. Arriving at the marsh, we immediately notice the visitors. A family of eight Wood Storks mingle with Great and Snowy Egrets. 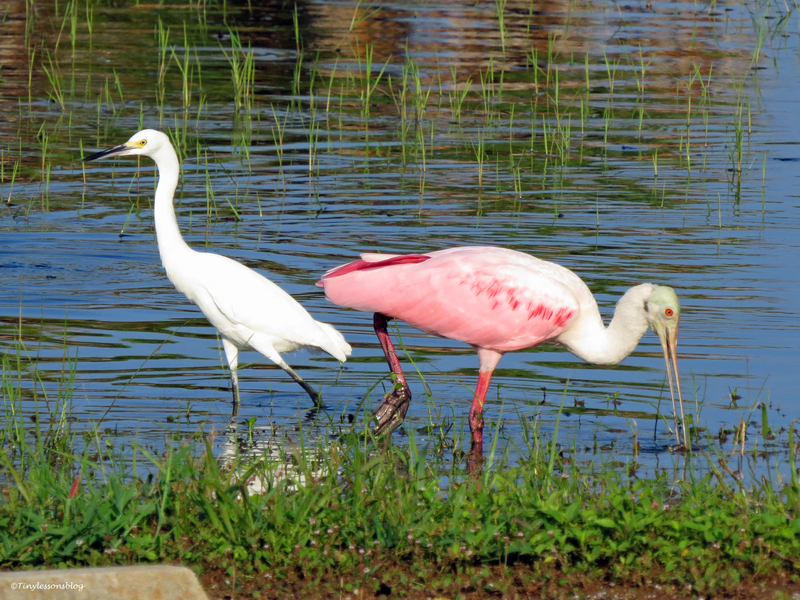 The Great Egret wants to show the visitors who’s the boss, and some loud exchanges follow. But where is the real boss, the Mayor? We walk towards the osprey nest and find him hiding in the bushes right below the osprey nest. It seems he doesn’t want to get involved in any squabbles, but rather prefers to take some quiet time to enjoy the morning. And the same goes for Mama Sandy. She has just caught a fish and turns to greet us before starting her breakfast. Then we spot the showman. The Reddish Egret performs his hunting dance. The clown of the marsh, as I dubbed him two years ago, draws his energy from a large audience. And today is no exception. But the smaller herons, apart from the Snowy Egrets, have decided to stay away from the ‘big boys’. Walking home, we find one of them, the Little Blue Heron, hunting alone on the bay. The low tide has revealed new and interesting fishing grounds. I hope you enjoyed this three mile walk in the crisp autumn air – a rare treat for us this early in the season. At home another treat is waiting. The Audubon Society has received a grant from Duke Energy, our power company. Yay! Thank you to all who have contributed! We are now much closer to having the new dish platform for the Osprey couple installed on time. We all wish you a wonderful week. Love is Blooming. And Now I’m Really Worried. When I came home earlier this week, I saw what I had been waiting for. The sky dance. It is the annual ritual Papa Stanley performs for Mama Sandy before they start their big “nestoration” project. I admired the dance from my terrace, but came to the conclusion it was impossible to document. For me, that is. Stanley soared high up over the nest in undulating flight. 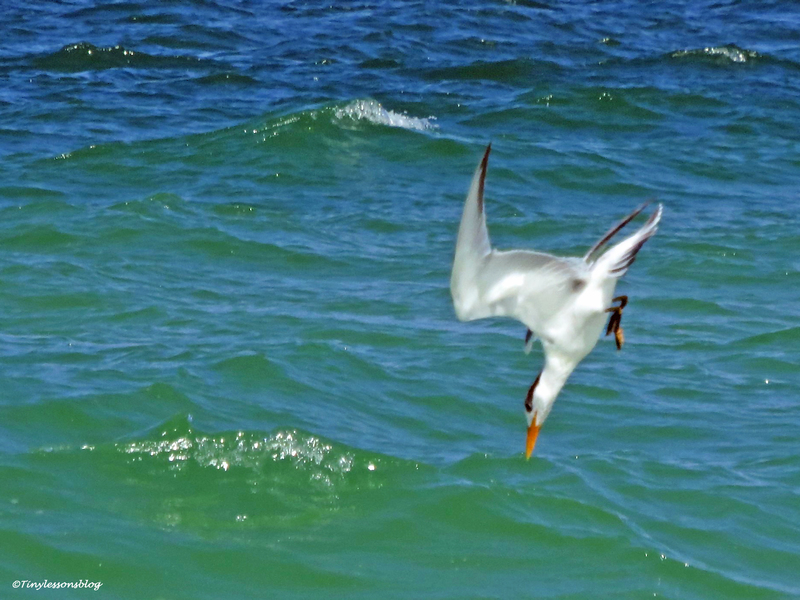 At the top of the undulation, he hovered briefly and then dove down his wings drawn in. This lasted probably 15-20 minutes, but I only had my camera for the last five minutes. I captured him in the middle of the flight, including when he briefly glanced at me, and again when he was almost on the ground close to the nest. It was fascinating to watch, and I noted it happened exactly on the same day as last year. A proposal every year. That’s love. And from that point on they have been busy rebuilding the completely bare nest. I have been busy with work too, and only seen their building project from my windows. Until yesterday. I had planned to sleep in, but woke up at sunrise. I went out on the terrace to have my coffee and to capture the atmosphere of the early hour. In addition to a beautiful sunrise, I saw an Osprey in the nest. I took one quick handheld shot – and saw the progress. Did you know that Osprey can build a nest as fast as 7-10 days? And these guys had been busy as you can see. So after finishing my coffee, I went out to see my friends for the first time in ten (!!) days. The first bird I spotted was a male Red-bellied Woodpecker. He was enjoying his breakfast on the shade side (of course) of a bent palm tree just outside our garden. Next I found Mama Sandy eating a fish on a lamp-post close to the park. I was wondering why she didn’t eat at the nest. Once at the salt marsh, I understood. Stanley had given her the fish, and she had decided to have her breakfast in relative privacy. Stanley was minding the nest. He was working too. On the redesign stuff. And kept a keen eye on Sandy. I said hi to him, and then walked around the marsh to check who was there at this early hour. Right under the nest, in his usual “bedroom”, I found my friend, the juvenile Yellow-crowned Night Heron. He had nodded off, drying his wings in the morning sun. Close by, I found the young Muscovy Duck. It looks like he’s been hired as a body guard by the Moorhens. They seem to spend lots of time together. When I reached the other end of the marsh, I spotted the Mayor. He was in his office on the little islet, as always. Checking things out. I thought he was quite photogenic in the early morning sun. A young Great Egret was busy hunting and didn’t pay any attention to me. But I admired her reflection. 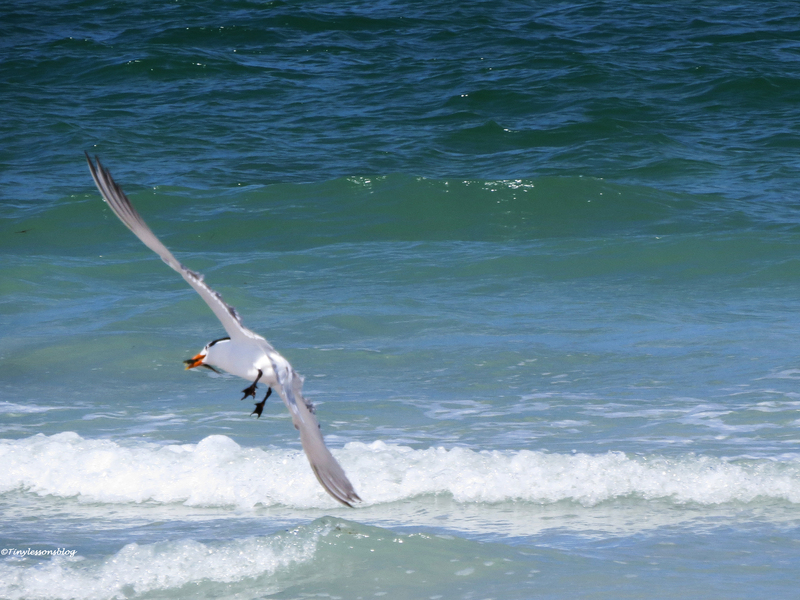 That’s when I saw Mama Sandy flying back to the nest. She had finished her breakfast and wanted to spend some time with hubby. They were too cute. I sat down on “my” bench to watch these love birds. And that’s when I realized what I was seeing. This. The nest platform is falling apart. I had seen signs of that already earlier. The nails come out at a couple of corners, and the net at the bottom is in bad shape. I had talked to the park service staff several months ago about the need to do repairs at off-season. They told me the nest was built by boy scouts and they would need to repair it. I even offered to pay for the repairs, but nothing has happened. Such things don’t seem to be in anyone’s job description. And now it’s much worse. The whole platform is unstable. I worry that we might have real drama, or even a tragedy, at the salt marsh this nesting season if nothing is done. Just when I sat there in deep thought, Stanley decided to leave. And I did too. 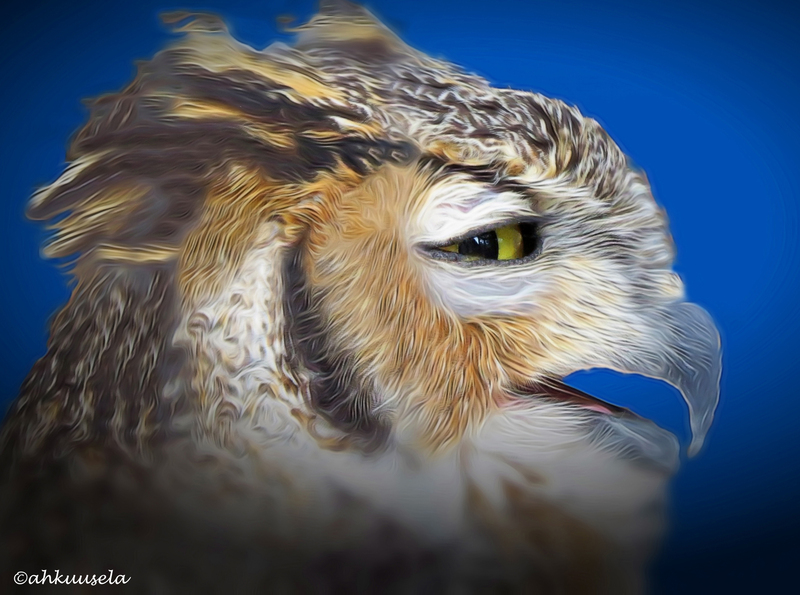 I would go home and write to the Audubon Society hoping that they could come up with something useful they or I can do. The Osprey family needs emergency repairs. Yesterday. 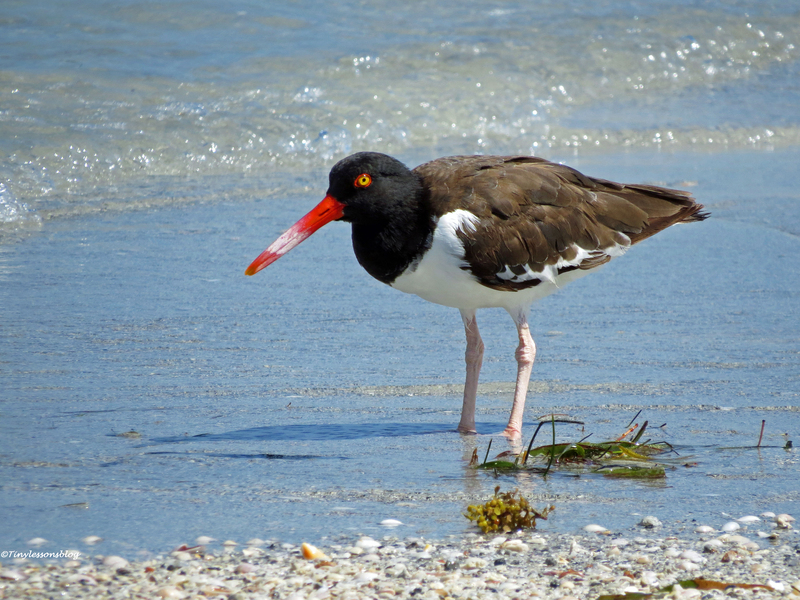 I walked home on the bay side and saw three more birds, a beautiful Snowy Egret in breeding plumage, a curious Willet and an Oyster Catcher. And found where Stanley had flown. He was at his favorite outlook spot on Marriott’s roof. His breakfast was already a bit late, so he scanned for fish in the bay. But also kept an eye on Sandy in the nest. UPDATE: This morning we’re experiencing heavy storms with 35-40 mile winds. TG the nest platform is still in place. I just saw Papa Stanley struggle against the wind to check on the nest – or on Mama Sandy? It was extremely difficult for him to fly, he went almost upside down a couple of times and was thrown sharply up and down by the gusts. I hope to spot both of them later this afternoon when the storms are expected to subside. After the Big Rains. Long Lineup to the Smorgasbord. 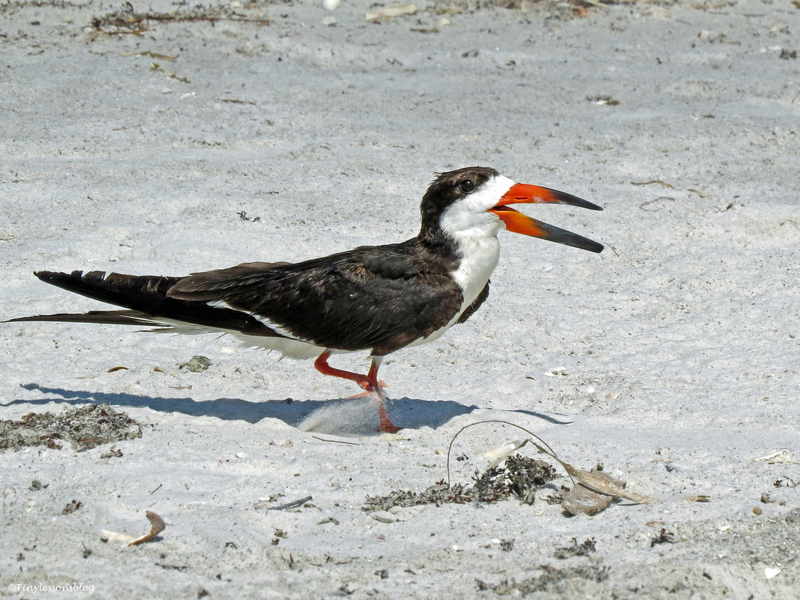 Many Black Skimmer parents have been encouraging their teenagers to start flying. That’s been quite amusing to watch. Like this mom and her baby. Mom nudged the baby asking her to practice flying. But she’d only flex her wings halfheartedly. While her pop, a few feet away, would dig in the sand impatiently, and “bark” at her to go up in the air already. 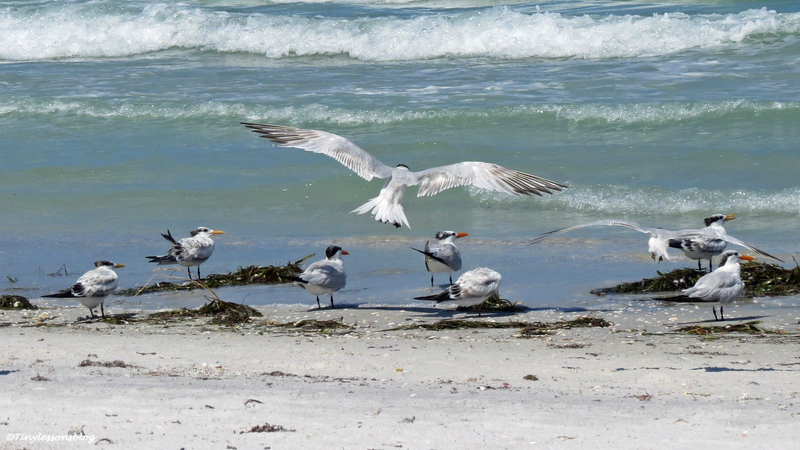 And the beach has been swarming with Royal Terns, Sandwich Terns and gulls. 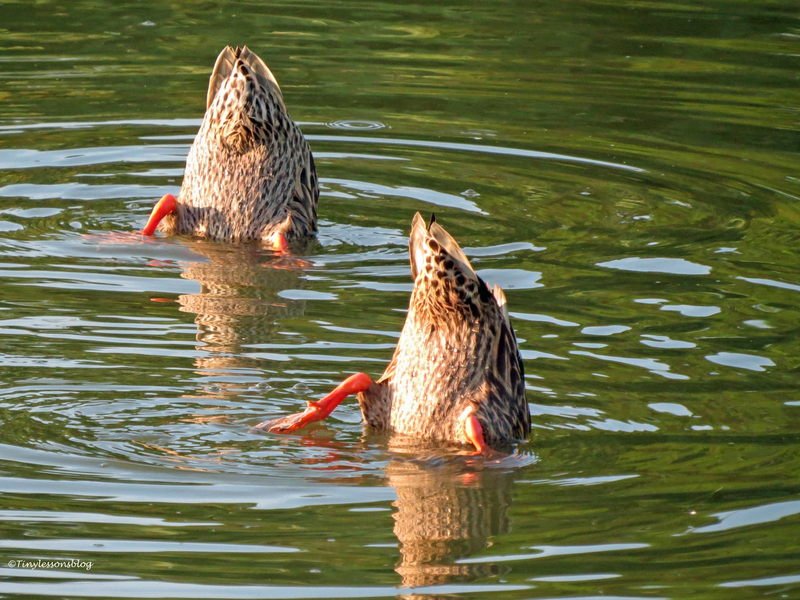 Some practicing synchronized preening. Others fishing. And yet others arguing with their parents. 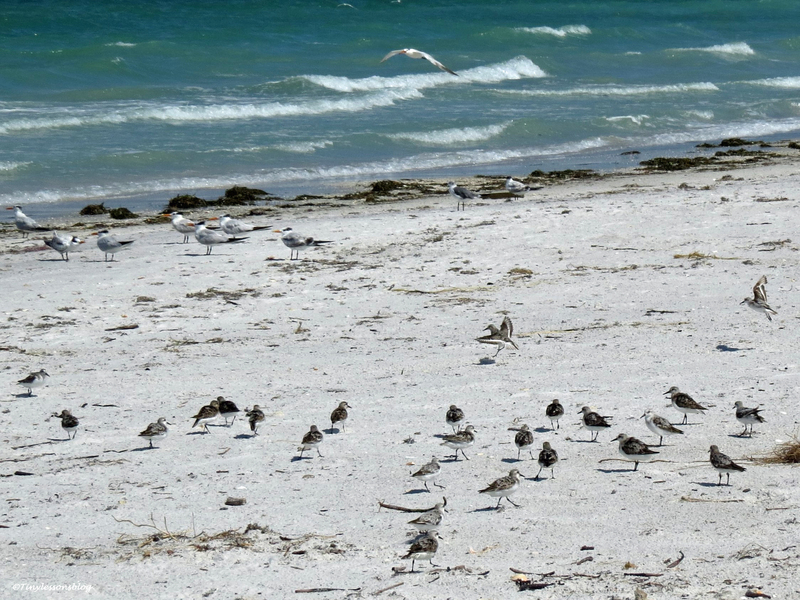 And the tiny Sanderlings have brought their whole extended family to enjoy the beach. Where they were mixing with Willets and American Oystercathers. So many birds! 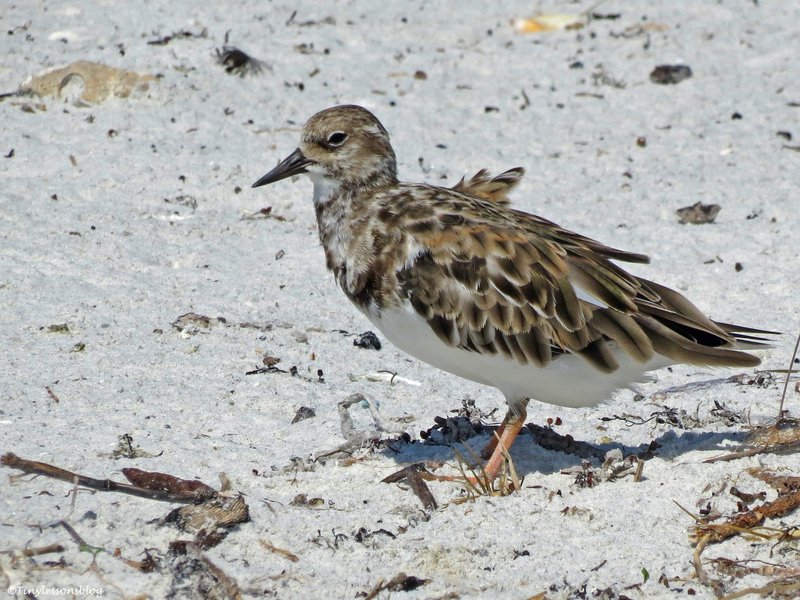 And for the first time ever, I’ve spotted a baby Ruddy Turnstone. She was tentatively examining the beach with her mom fairly close by. The same has been true for the park next to the salt marsh. 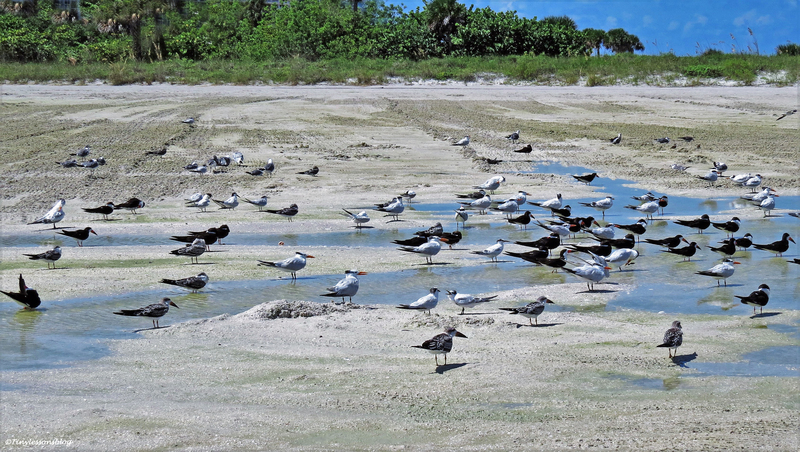 Long lines to the smorgasbord at shallow ditches still filled with fresh rainwater. 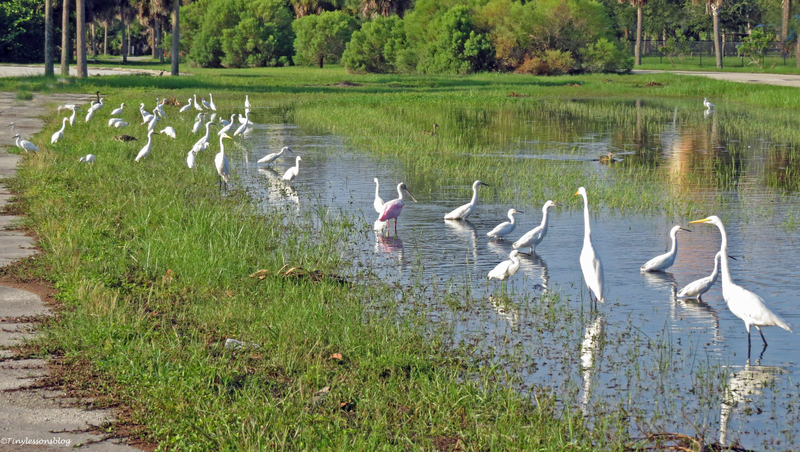 Great Egrets, Snowy Egrets, Spoonbills, Ibis, Night Herons, you name it. All sharing the rare treat of fresh water. At the salt marsh, Mama Sandy has taken charge. I guess the Mayor is on vacation as I haven’t seen him since last week. Sandy has been sitting at the front edge of the nest following the developments with a keen eye. For the most part things have been going smoothly, but I noticed some competition about great scanning posts among the many egrets. At least forty of them. Sandy also kept an eye on the skies. 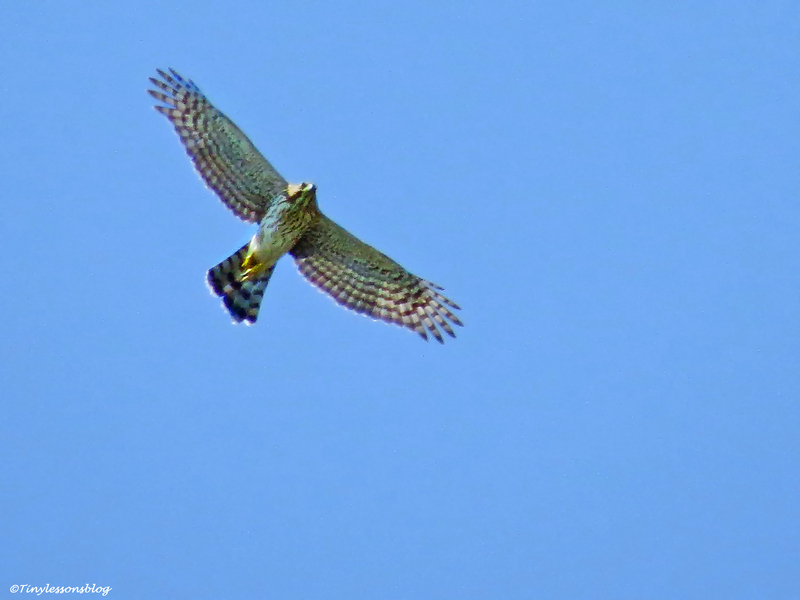 And when I followed her line of sight, I saw a Red-shouldered Hawk flying high above the marsh. I was hoping the hawk didn’t spot the ducklings performing synchronized diving in the deep waters. 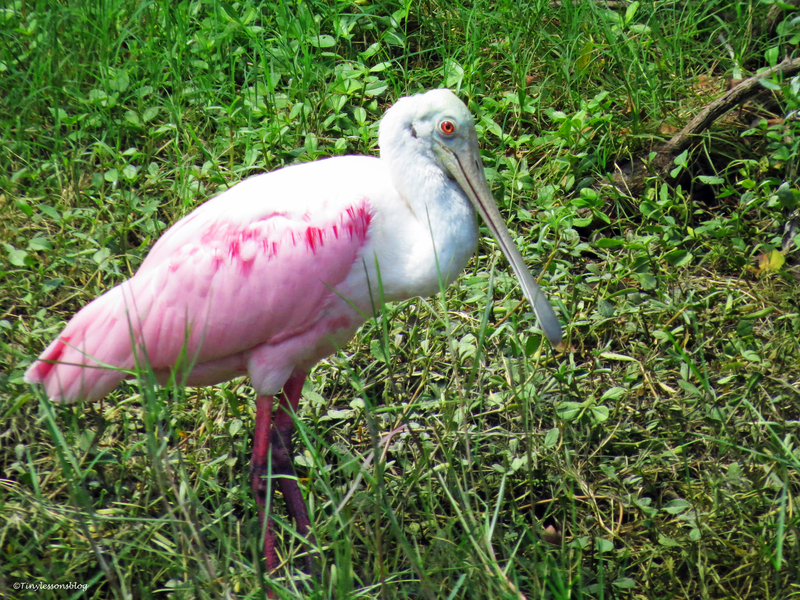 Rosa, the resident Roseate Spoonbill, had not cared to venture out of the marsh to see her cousins feeding in the remaining floodwaters elsewhere in the park. 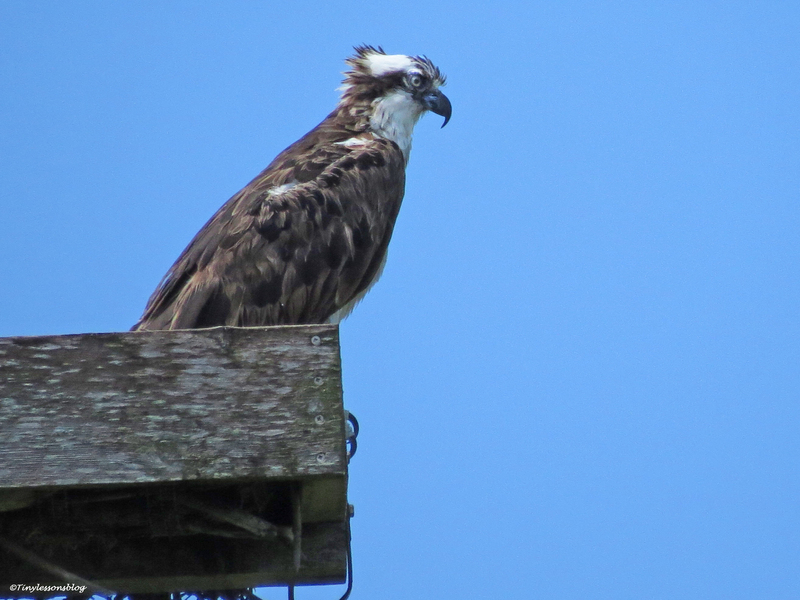 She was at home, in the shade under the osprey nest as usual. 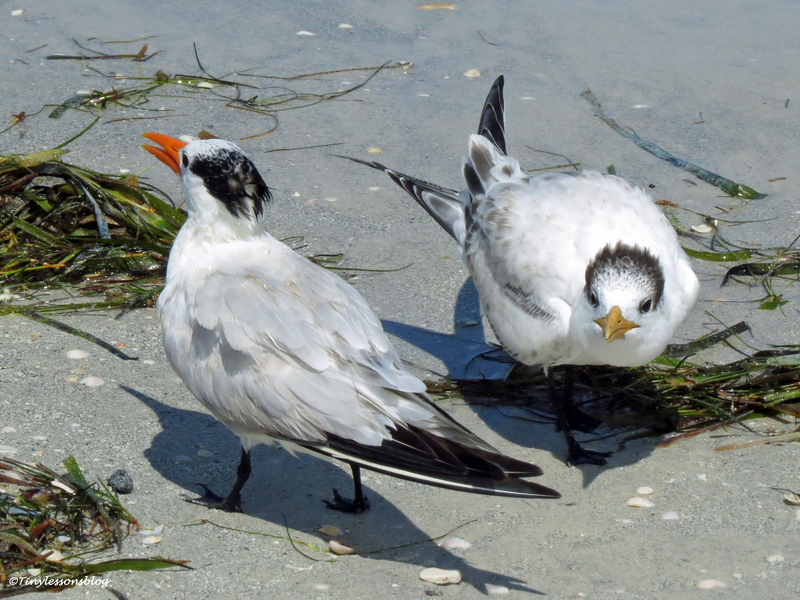 I hope you enjoyed the many birds saying hello to us here on the beach and at the salt marsh. I’m flying away too for a few days (this is a scheduled post). I’ll try to stay in touch on my mobile devices. In any case I’ll catch up early next week. I wish you all a wonderful weekend. Remember to enjoy what nature has to offer. Fly high!